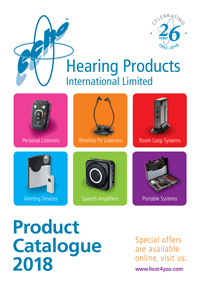 1.1 – These terms of sale (Terms) apply to all products supplied by Hearing Products International Limited, a company registered in England and Wales under company registration number 02531653 whose registered office is at Echo House, 26 Haigh Park, Haigh Avenue, Stockport, SK4 1QR (referred to as “we” or “us” or “our”) whether such products are ordered via our website (www.hear4you.com), through our catalogue, over the telephone or by any other means of communication. 1.2 – No contract exists between you and us for the sale of any products we offer for sale (Products) until we have received and accepted your order by either sending you confirmation in writing or by email to the address or email address you have given or by dispatching the Products to you (Dispatch Confirmation). Once we do so, there is a binding legal contract between you and us (the Contract). 1.3 – The Contract is subject to your right of cancellation (see below). 1.4 – We may amend these Terms from time to time. Please look at the top of this page to see when these Terms were last updated. 1.5 – Every time you order Products from us, the Terms in force at the time of your order will apply to the Contract between you and us. 1.6 – We may revise these Terms as they apply to your order from time to time. 1.7 – If we have to revise these Terms as they apply to your order, we will contact you to give you reasonable advance notice of the changes and let you know how to cancel the Contract if you are not happy with the changes. You may cancel either in respect of all the affected Products or just the Products you have yet to receive. If you opt to cancel, you will have to return (at our cost) any relevant Products you have already received and we will arrange a full refund of the price you have paid, including any delivery charges. .
1.8 – By placing an order with us you warrant that you are of 18 years of age and are legally capable of entering into binding contracts. 2.1 – The description and price of the Products you order will be as shown in our current catalogue or on our website at the time you place your order. 2.2 – The images of the Products on our website and in our catalogue are for illustrative purposes only. Although we have made every effort to display the colours accurately, we cannot guarantee that your computer’s display of the colours or the colours in the catalogue accurately reflect the colour of the Products. Your Products may vary slightly from those images. 2.3 – The packaging of the Products may vary from that shown on images on our site or in our catalogue. 2.4 – The Products are subject to availability. If on receipt of your order the Products you have ordered are not available in stock, we will inform you as soon as possible, and either refund or re-credit you for any sum that has been paid by you or debited from your credit card for the Products or offer you alternative Products which are as close to the original item as possible. 2.5 – Every effort is made to ensure that prices shown in our current catalogue or shown on our website are accurate at the time you place your order. If an error is found, we will inform you as soon as possible and offer you the option of reconfirming your order at the correct price or cancelling your order. If you cancel, we will refund or re-credit you for any sum that has been paid by you or debited from your credit card for the Products. 2.6 – In addition to the price, you will be required to pay a delivery charge for the Products, as shown in the section of our catalogue or website about delivery. 2.7 – The price of the Products and delivery charges are inclusive of VAT. VAT relief may be available on the Products on completion of the appropriate form available either in our catalogue or on our website. Out VAT registration number is GB 606 4762 40. Payment for the Products and delivery charges can be made by any method shown in our current catalogue or on our website at the time you place your order. 4.1 – The Products you order will be delivered to the address you give when you place your order, except that deliveries are not made outside the United Kingdom, and some parts of the United Kingdom (Channel Islands, Scottish Highlands and Northern Ireland) are not covered. 4.2 – If delivery cannot be made to your address or can not be made within 30 days of the date of the Dispatch Confirmation, we will inform you as soon as possible, and either refund or re-credit you for any sum that has been paid by you or debited from your credit card for delivery or agreed an alternative date for delivery of the Products. 4.3 – If you order Products from us for delivery outside the UK, they may be subject to import duties and taxes which are levied when the delivery reaches the specified destination. You will be responsible for payment of any such import duties and taxes together with all handling charges, shipping costs and insurance which may apply to your order. Please note that we have no control over these charges and cannot predict their amount. Please contact your local customs office for further information before placing your order. 4.4 – If an order for delivery to an address in mainland Britain is received by us by 2pm on a Monday to Friday (excluding bank holidays and the period between 23rd December and 2nd January), the Products in question are in stock and your payment has been received in cleared funds then we will usually dispatch the Products the next working day. 4.5 – Delivery of some Products may be by a service which requires a signature on receipt. If there is no one at the address given who is competent to accept delivery of the Products and provide the required signature, you will be notified of an alternative delivery date or a place to collect the Products. You will be responsible for any extra delivery charges associated with any such re-delivery up to a maximum of £25.00 (twenty five pounds). 4.7 – Every effort will be made to deliver the Products as soon as possible after your order has been accepted, and in any event within 30 days of the Delivery Confirmation. However, we will not be liable for any loss or damage suffered by you through any reasonable or unavoidable delay in delivery. In this case, we will inform you as soon as possible. 4.8 – You will become the owner of the Products you ordered and responsible for risk of loss of or damage to them once they have been delivered to you. 5.1 – If you are a consumer, you have a legal right to cancel the Contract for the supply of Products during the period set out below in clause 5.2. This means that during the relevant period if you change your mind or decide for any other reason that you do not want to receive or keep the Products, you can notify us of your decision to cancel the Contract and receive a refund. Advice about your legal right to cancel the Contract is available from your local Citizens’ Advice Bureau or Trading Standards office. 5.3 – To cancel a Contract, you just need to let us know that you have decided to cancel. The easiest way to do this is to complete the cancellation form on our website www.hear4you.com/cancellation and also at the end of these Terms. A link to the website cancellation form will be included in our Dispatch Confirmation. If you use this method we will email you to confirm we have received your cancellation. You can also e-mail us at info@hear4you.com or contact us by telephone on +44 (0)161-480-8003. If you are e-mailing us please include details of your order to help us to identify it. If you send us your cancellation notice by e-mail, then your cancellation is effective from the date you send us the e-mail. If you cancel the Contract you will then be given a Return Merchandise Authorisation number (“RMA”) which we ask is enclosed and quoted when you return the Products to us. 5.4.3.2 – if you have not received the Product or you have received it and we have offered to collect it from you: 14 days after you inform us of your decision to cancel the Contract. 5.5 – If you have returned the Products to us under this clause 5 because they are faulty or mis-described, we will refund the price of the Products in full, together with any applicable delivery charges, and any reasonable costs you incur in returning the item to us. 5.6 – We will refund you on the credit card or debit card used by you to pay. 5.7.2 – unless the Product is faulty or not as described (in this case, see clause 5.5), you will be responsible for the cost of returning the Products to us. If the Product is one which cannot be returned by post, we estimate that if you use the carrier which delivered the Product to you, these costs should not exceed the sums we charged you for delivery. If we have offered to collect the Product from you, we will charge you the direct cost to us of collection. 5.8 – Because you are a consumer, we are under a legal duty to supply Products that are in conformity with the Contract. As a consumer, you have legal rights in relation to Products that are faulty or not as described. These legal rights are not affected by your right of return and refund in this clause 7 or anything else in these Terms. Advice about your legal rights is available from your local Citizens’ Advice Bureau or Trading Standards office. 6.1 – All Products supplied by us will be of satisfactory quality and reasonably fit for all the purposes for which products of the kind are commonly supplied for 12 months from the date of supply other than headphones, leads, microphones and other such consumables which have a 90 day warranty and batteries whereby we will pass on to you the benefit of the manufacturer’s warranty whatever this may be. This warranty, and nothing with these terms of sale, shall affect your statutory rights as a consumer. 6.2 – The above warranty does not apply to any defect in the Products arising from fair wear and tear, wilful damage, accident, negligence by you or any third party, use otherwise than as recommended by us, failure to follow our instructions, or any alteration or repair carried out without our approval. 6.3 – If the Products supplied to you develop a defect while under warranty, or you have any other complaint about the Products, you should notify us in writing at the address, fax number or email address set out in our catalogue and on our website. 6.4 – No warranty, representation or guarantee is given that any Products will restore hearing to normal capacity and you are advised to consult a qualified medical practitioner (initially and on an on-going basis) to ensure that the Products are suitable for your use (and continue to be so over time). 6.5 – If we fail to comply with these Terms, we are responsible for loss or damage you suffer that is a foreseeable result of our breach of these Terms or our negligence, but we are not responsible for any loss or damage that is not foreseeable. Loss or damage is foreseeable if it is an obvious consequence of our breach or if it was contemplated by you and us at the time we entered into this contract. In any event, our liability for losses you suffer as a result of us breaking this agreement is strictly limited to the purchase price of the Products you purchased. 6.6.4 – for any matter for which it would be illegal for us to exclude, or attempt to exclude, our liability. 6.7 – To the extent the law allows, we shall not responsible for indirect losses which happen as a side effect of the main loss or damage, including but not limited to loss of income or revenue, loss of business, loss of profits or contracts, loss of anticipated savings or loss of data. 7.1 – When you return Products to us for any reason other than in accordance with your right of cancellation (as set out at clause 5 above), for instance because you claim that the Products are defective, you will need to follow the procedure at clause 7.2 below. We will examine the returned Products and will notify you of your refund via e-mail or writing within a reasonable period of time. Products returned by you because of a defect will either, at our discretion, be refunded in full, including a refund of the delivery charges for sending the item to you and the cost incurred by you in returning the item to us, or we will supply you with replacement Products. If we decide to give you a refund we will usually process the refund due to you as soon as possible and, in any case, within 30 days of the day we confirmed to you via e-mail or in writing that you were entitled to a refund for the defective Products. 7.2 – When you contact us to return Products under clauses 7.1 or 7.2 above you will be given a Return Merchandise Authorisation number (“RMA”) which we ask is enclosed and quoted when you return the Products to the Supplier. We request that you return the Products to us as soon as reasonable practicable and along with your proof of payment. 8.1 We will take all reasonable precautions to keep the details of your order and payment secure, but unless we are negligent, we will not be liable for unauthorised access to information supplied by you. 8.3 You can correct any information about you, or ask for information about you to be deleted, by giving written notice to us at the address, fax number or email address shown on our website or in our catalogue. 8.4 You will receive marketing communications from us if you have requested information from us or purchased goods from us or if you provided us with your details when you entered a competition or registered for a promotion and, in each case, you have not opted out of receiving that marketing. 8.5 You can ask us to stop sending you marketing information at any time by following the opt-out links on any marketing message sent to you or by contacting us at any time. Where you opt out of receiving these marketing messages, this will not apply to personal data provided to us as a result of a product/service purchase, warranty registration, product/service experience or other transactions. 9.1 – We will not be liable or responsible for any failure to perform, or delay in performance of, any of our obligations under a Contract that is caused by an Event Outside Our Control. An Event Outside Our Control is defined below in clause 9.2. 9.2 – An Event Outside Our Control means any act or event beyond our reasonable control, including without limitation strikes, lock-outs or other industrial action by third parties, civil commotion, riot, invasion, terrorist attack or threat of terrorist attack, war (whether declared or not) or threat or preparation for war, fire, explosion, storm, flood, earthquake, subsidence, epidemic or other natural disaster, or failure of public or private telecommunications networks. 9.3.2 – our obligations under a Contract will be suspended and the time for performance of our obligations will be extended for the duration of the Event Outside Our Control. Where the Event Outside Our Control affects our delivery of Products to you, we will arrange a new delivery date with you after the Event Outside Our Control is over. 10.1 – We may transfer our rights and obligations under a Contract to another organisation, but this will not affect your rights or our obligations under these Terms. 10.2 – You may only transfer your rights or your obligations under these Terms to another person if we agree in writing. 10.4 – Each of the paragraphs of these Terms operates separately. If any court or relevant authority decides that any of them are unlawful or unenforceable, the remaining paragraphs will remain in full force and effect. 10.5 – If we fail to insist that you perform any of your obligations under these Terms, or if we do not enforce our rights against you, or if we delay in doing so, that will not mean that we have waived our rights against you and will not mean that you do not have to comply with those obligations. If we do waive a default by you, we will only do so in writing, and that will not mean that we will automatically waive any later default by you. 10.6 – Please note that these Terms are governed by English law. This means a Contract for the purchase of Products through our site and any dispute or claim arising out of or in connection with it will be governed by English law. You and we both agree to that the courts of England and Wales will have non-exclusive jurisdiction. However, if you are a resident of Northern Ireland you may also bring proceedings in Northern Ireland, and if you are a resident of Scotland, you may also bring proceedings in Scotland.